To the south of the heavily populated town of Dehiwala is Subodarama Road on the landside of Galle Road. About 200 metres along this narrow road, located on a small hillock, is the historical Karagampitiya Buddhist temple with its statues and paintings standing for over 300 years. In the past, Karagampitiya belonged to the ancient Kingdom of Kotte and came under the region of Medimala, the western coastal area of which was exclusively allocated to the fishing community whose primary duty was to supply fish to the royal palace during the reign of King Parakramabahu VI (AD 1411-61). The eastern slopes of the Medimala region, which was rich in plantation, was reserved for the King's relatives (Medha-Maila) and came to be known as 'Nedimala'. Karagampitiya had been a vast coconut plantation and its few dwellers were assigned the task of supplying coconuts and coconut produce to the palace, which were taken in bullock carts. History records that it was Parakramabahu VI who established himself and founded what came to be called the Kotte Kingdom in 1415. His capital initially was at Raigama. He reigned for fifty five years and was the first Sinhalese King since the days of Parakramabahu I and Nissanka Malla, to bring the whole island under his rule, and the last ever to do son. On a request made by the king's relatives, a Devalaya was constructed on the Karagampitiya hill-top in proximity to a giant Na tree with the two-fold aim of providing protection to the sea-faring fishermen and safeguarding the kingdom from enemy invaders. 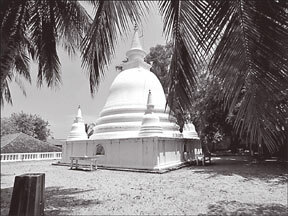 The trusteeship of this devalaya was later transferred to the Natha Devalaya in Pepiliyana. 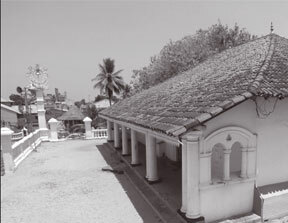 The Portuguese destroyed the devalaya in an attack and made use of its massive stones to erect the St Anthony's chapel in Mt Lavinia. During the Dutch period (AD 1658-1796) a church, which still remains intact was built on the eastern slopes of the Karagampitiya hill, with a wayside Inn almost opposite. 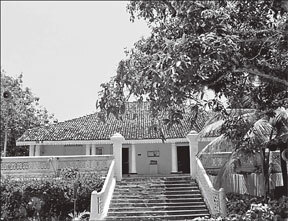 The first incumbent of the Karagampitiya Subodarama temple, the Ven Hikkaduwe Indrajothi Thera had spent much time in this inn. The ancient Subodarama has been constructed on different levels of land-soil. 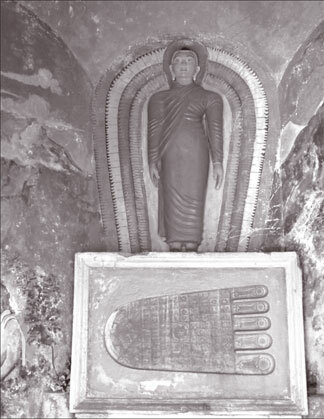 The Sathsathi Geya depicting the seven weeks the Buddha spent immediately prior to his Enlightenment, the Dharma Salawa in which sermons are held on poya days and the Sripada Geya, were constructed around the year 1895. The statues in the Viharage was sculptured by the same sculptor who did those of the Kelani temple in 1780 during the reign of King Kirthi Sri Rajasinghe, which were destroyed by the Portuguese, and bear much resemblance to the Kelani temple statues. There is a speciality in the eyes of the reclining Buddha statue in the temple. They consist of two priceless blue sapphires embedded. The sapphire eyes can be seen only when a light, a coconut oil lamp, is held against them. A torch light is not permitted to be flashed as it is considered degrading to do so into the eyes of even a Buddha statue. Built in the 1820s, the Image Hall of the temple consists of mosaic patterns of the 18th century hill country and those of the 19th century, linked to the low country. 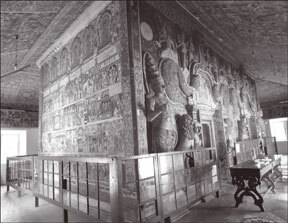 The wall paintings belong to the third quarter of the 19th century. Those on the inner walls are contemporary with the Rankoth Viharaya in Panadura and had been completed in 1897. The attractive floor area of the temple near the entrance door had been embedded with VOC coins of the Dutch era, but none of them remain today. Dutch ceramics and tiles can be seen in the hall area including the aisles. The statues of the Buddha which look almost alive and the paintings of the Viharage had been done in the years 1932 and 1950. 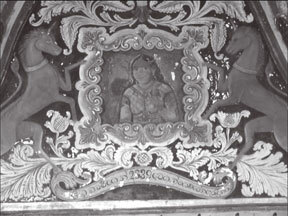 An important aspect of the viharage is the decorative motif on the main door of the temple above which is a Makara portico, a unicorn and a figure of a female donned in mortar. In addition, is sculptured the figure of Queen Victoria who was enthroned Queen of Great Britain and the British colonies to which Ceylon at that time belonged. 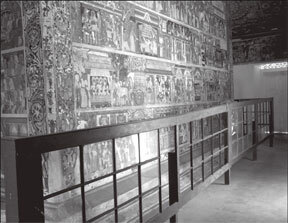 The inner-walls of the image house have been dedicated to paintings of Jathaka stories relating to the Buddha. The lower part of the walls portray designs of flower petals. At the inception, the temple had been known as Sunandaramaya, the name being adopted from the centre of the Lanka Amarapura Nikaya at Ambalangoda which was formed during the reign of Sri Wickrema Rajasinghe in 1800. Work on the Chaitiya was completed in 1796 and a sapling of the Sri Mahabodiya of Anuradhapura was planted. The sermon hall is furbished in polished timber most beautifully and carry paintings as well. A timber fence also decorates the viharage. Due to the suppression of Buddhism during the colonial era, there had been restrictions imposed on temple activities and the Governor's permission had to be obtained to conduct pinkamas and peel the bells of the temple. This temple however has had the patronage of leading Sinhala warriors and chieftains including Vilbawe the pretender, who obtained advice from Hikkaduwe Wimalagnana Thera, the second incumbent of the temple. Records reveal that up to the present day, there have been no loss than six Viharadhipathi who held position in this temple. Mention has been made of this Subodarama temple in 'The Book of Ceylon' written by Henry William Cave in 1909 and in 'A New Model of the Universe' by P D Ouspensky in 1914. Ouspensky statues that the Buddha statues have look almost alive and has similarities with the Phoenix statutes of Egypt. The brightness of the eyes, the author states, seems to reflect the understanding of the world. This book was translated in German and there have been many foreigners visiting the temple to admire the Buddha statues here, which reflect the historical importance of the temple. Details of the Subodarama temple are seen in stone engravings in Pepiliyana temple in the Thisara Sandesaya and the Paravi Sandesaya written by the Ven Hikkaduwe Sumangala Thera. The valuable paintings in this temple are of immense value to students of art and painting. Unfortunately, the upper parts of the motar walls have peeled off, and the paintings in certain places have become discoloured. It will be the duty of the relevant authorities to restore and preserve the paintings and statues of the historical Karagampitiya Subodarama temple for posterity.